Watch as Barbie's friend Kayla rapidly changes from an ordinary high school student into a Charm Girl! 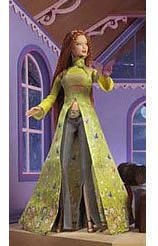 Size (inches): 8.66" X 2.36" X 12.99"
A completely gorgeous doll! Beautiful red hair and face that looks mystical and ethereal. As i love red haired barbie dolls and friends, i cannot fault this doll at all. She's one of my favourites in my collection. Love the outfit too, matches her complexion and eyes wonderfully. Ok enough of the gushing LOL. I rate her five stars. After looking all over in stores here, I was about to give up. I was in a near state of panic when I remembered someone said that you had them! I almost ran to the computer to order her! My granddaughter really wanted her BAD! And I was thrilled that it arrived in plenty of time for Christmas! Thank you ZooScape for making her Christmas better and for saving the day!